I’ve visited hundreds of schools (loads even ask me back year after year!) 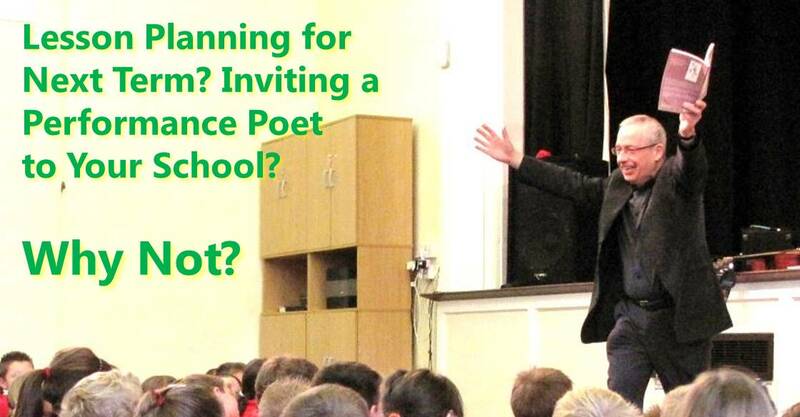 and never tire of kicking off the school day with a performance (often to the whole school – Reception & Infants at the front and those grown-up Year 6 at the back, and all those bigger people on the chairs at the side) and then spending the rest of the day leading poetry workshops. I’ve been to Arkengarthdale, Beverley, Birmingham, Bridlington, Bristol, Coventry, Darlington, Durham, Goole, Hipswell, Hull ….Knaresborough, Manchester, Northallerton….Richmond, Ruswarp….Scarborough, Skipton, Stockport, Thirsk….right through the alphabet to Warrington, Whitby and York. (Nowhere beginning with a Z…..yet!). Performances for all ages lasting 30–40 minutes – mostly KS1, 2, 3 and family sessions. These can be for the whole school or smaller groups. Plenty of audience participation. (Guitar playing included at no extra cost!). Workshops for all ages. I fit in with the school’s requirements. In some schools I spend a day with one class & in others visit as many classrooms as required. Usually I give writing ideas/models while we’re all together so that teachers & pupils can begin work as soon as they’re back in the classroom. A visit often ends with everyone back together to hear the new poems. If you want to book a performance or workshop, please email or ring to check cost and availability. Bernard Young is in a staffroom. Waiting. He’s got his first mug of tea. (So it’s going to be a good day. KS1 are already filing into the hall. sitting with his mug of tea. He’s wondering whether to wave. But doesn’t. He decides a smile is more appropriate. Rows and rows of children. The Head begins her introduction. He’s glad he’s got his guitar.